In 1969, the Virginia Jaycees' local presidents rallied around a vision -- Bill Robertson’s vision -- to create a camp to serve individuals with intellectual and developmental disabilities. Bill Robertson, a young Jaycee from Roanoke, identified the need for a special needs recreational camp, and convinced The Virginia Jaycees to sell apple jelly in order to fund and build the original Camp Virginia Jaycee. 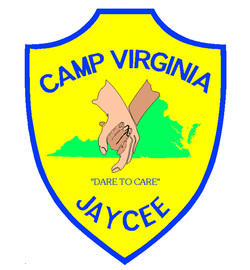 In one day, Jaycee chapters across Virginia raised $60,000 and Camp Virginia Jaycee was born. Since that time, the Virginia Jaycees, the Life Member Association and the Corps of Virginia Gentleman have raised funds for land acquisition, buildings, facility maintenance, and camperships. Jaycee chapters have created numerous events to sponsor campers from their local communities. Some of the most notable projects include Christmas tree sales, haunted houses, East Coast Surfing Championship, music festivals, and pig roasts. Together with other partners, we have served over forty thousand individuals who needed our assistance. Jaycees have maintained the camp throughout its history. Annually, twice a year, Jaycees from across Virginia have converged on the camp for a weekend "work party" to build, fix, and clean the camp. Cabins, building and other features at the camp have been sponsored by individuals, chapters and regions. The camp is our legacy and we strive to maintain its beauty and spirit in all we do. In 2013, the first annual Founder's Day Celebration was held at Camp Virginia Jaycee to honor our Founder Bill Robertson. Jaycee chapters, businesses and individual supporters contributed $40,000 to honor Bill. Hundreds of campers and their families attended for a day of carnival games, crafts and other activities. During the Founder's Dinner, special guests, campers and their family were honored. The evening was topped off with an inspiring message from Founder Bill Robertson reminding us all that the "dream is alive". Our camp is at it's best when it is filled with campers. The feeling and sheer joy of camp is expressed through the smiles, laughter and excitement. Camp is a feeling, a living spirit that fills your heart. For more information, visit the Camp Virginia Jaycee website: http://www.campvajc.org/.